Not to be confused! A tenderloin in the States is what we call in Sweden a pork filet (fläsk filet). A loin roast is the part that pork chops come from without the bone. 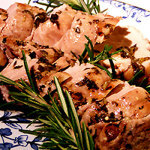 This is really a recipe for a marinade for pork tenderloin or any cut of pork that can be roasted. Preheat your oven to as high as it goes, mine says it heats to 275°C (500°F). Heating from below only. Trim and tie the pork lion, depending on the length of your roasting pan leave it whole, or cut in half. In a bowl just large enough to hold the loin of pork, chop finely all the herbs and add all the above ingredients and combine well. Add the pork lion, turning occasionally and allow to marinate for at least 2 hours. In a roasting pan place the pork and the marinade. This can be used as a sauce for the pork once cooked. Roast uncovered at 275°C (or 500°F) for 20 - 25 minutes. Not a minute longer. Remove from the oven and place on a cutting board. Allow to rest for about 10 minutes and cut in slices on the diagonal about 1.5 centimeter thick (or 1/2 inch). If you are using dried herbs, use half the amount I have listed above. You can use any combination of herbs that you would like. I prefer fresh herbs for this as they produce a better result. I also like the addition of the chili with the lemon as it adds a nice bite to the dish. Use a few flakes of dried chili if you don't have a fresh chili on hand. Sage is a strange herb, there is no comparison between dried sage which can taste soapy or moldy from fresh sage. I grow sage most of the year in a pot on the balcony because I am a fan of making my own sausage and you simply cannot use dried sage for that. I know the cooking time might seem strange but it works and I have been doing it this way for years now. 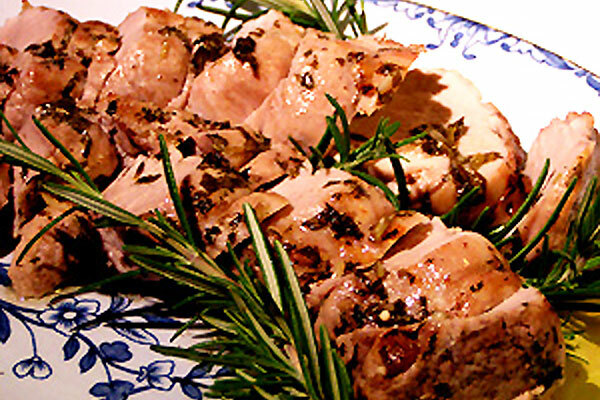 You will get a tasty and juicy pork tenderloin. If you cook it at this temperature for longer than 20 - 25 minutes it will just get tough and dry so set a timer for 20 minutes and check. Normally you do cook pork at a low temperature for a longer period of time than of veal or beef but this works great for a pork tenderloin. Use a roasting pan just large enough to hold the meat. No matter what anyone tells you about pork it does need to be cooked properly. The internal temperature of pork tenderloin needs to reach at least 76°C (or 170°F) The meat and any juices from it should just have turned clear without any sign of pink. There is no such thing as rare pork! It is important for all roasted meats to sit for a while when they come out of the oven. This will take about 10 minutes for a pork tenderloin.